Customer Highlight: Help - We Need More Space! Our Falcon Boxperts were recently presented with a customer challenge. A provider of rare specialty olive oil was in need of expansion space that offered mobility and flexibility and they needed space quickly. The need to keep this extra space with a constant cool temperature was important. Storage and even a fluid-handling lab needed to be built and located at the company’s headquarters. With prior experience using repurposed shipping containers for storage, our client Corners of Time reached out to our Boxperts with the need for a solution to their business expansion needs. 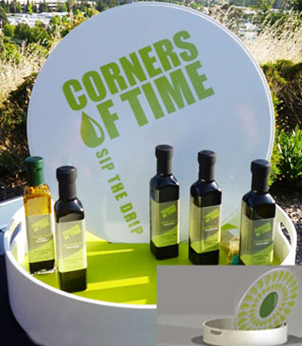 Corners of Time is a gourmet Mediterranean on-line marketplace offering specialty Lebanese olive oil, produced from the Lebanese olive trees they introduced to the US. Eight different modified containers were fabricated for Corners of Time at Falcon Structure’s headquarters and then located adjacent to the client’s headquarter office. The first stage in the process of filling an order for the olive oil is the bottling and container station. This food grade, fluid-handling lab was built inside a repurposed shipping container. Personnel doors were added for access as well as cargo doors to allow for the olive oil vats to be moved easily in and out of the lab. The remaining seven containers serve as the sole storage environment for all of the olive oil that is produced. To insure the life of the product it was inherent the environment was temperature controlled and fabricated with hi-grade spray foam insulation. The resulting project allowed Corners of Time to complete their fulfillment requirements and to safely store the precious product without the need for a permanent building structure. Space Requirements- The Repurposed shipping container could be modified to accommodate electrical and cooling needs. Quick Timeframe- The expansion need was fairly immediate and a repurposed modified container can be delivered in 2-3 weeks. It also allows for continued growth. Portability- Our client has two locations and the repurposed shipping container offers the portability to move the space where needed. Cost Containment- The ability to create storage and lab functions on site saved our client the cost of moving or building a permanent structure. Your next business need may require one of these factors and your solution may be a consideration of a repurposed shipping container.